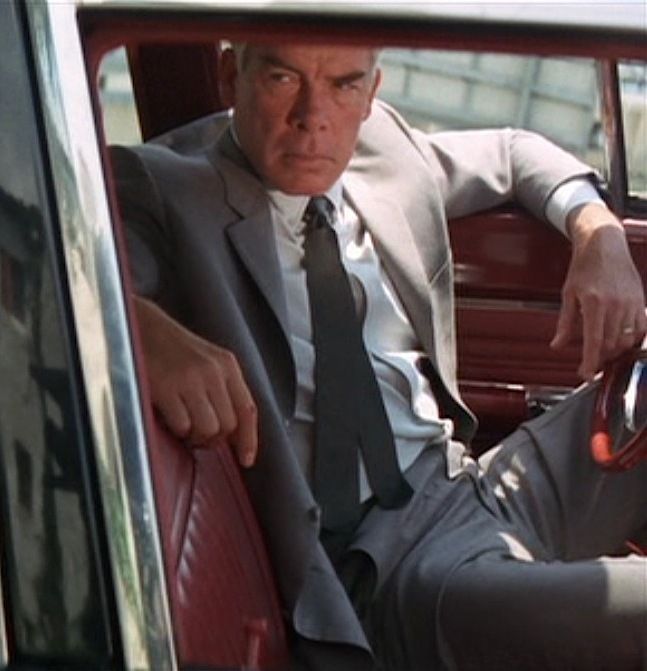 Lee Marvin as Walker in Point Blank (1967). Today in 1924, one of the ultimate classic movie tough guys, Lee Marvin, was born in New York City. After serving with the Marines in the Pacific Theater during World War II (and receiving a Purple Heart among other commendations), Marvin fell into acting and eventually became a household name as Chicago cop Frank Ballinger on M Squad, the show best lampooned by Leslie Nielsen and the ZAZ gang in 1982’s short-lived but brilliant Police Squad! Having achieved fame through acting, Marvin took his distinctive voice and badass demeanor to starring roles on the silver screen, culminating in 1967 with back-to-back badass hits The Dirty Dozen and Point Blank. The latter film was the first cinematic adaptation of Donald E. Westlake’s crime thriller The Hunter (written under the nom de plume Richard Stark). The novel itself was a massive success, and Westlake catapulted his stand-alone book about the criminal Parker into an eventual 24-book series that lasted until Westlake’s own death in 2008. In that time, The Hunter had been adapted into two films: Point Blank in 1967 and Payback in 1999. Although it was more or less overlooked at the time of its release, Point Blank has been more and more regarded with each passing decade, with film historian David Thomson referring to the “masterpiece” as both a “cool, violent pursuit film” and “a wistful dream”. The beginning of Point Blank finds Marvin’s character, renamed Walker, abandoned on Alcatraz Island after a heist involving his wife and her lover (ugh, hate that word). Walker patches himself up, suits up, and goes after “The Organization”, a shadowy group that his wife’s lover (eek!) has bought his safety from using the ill-gotten gains from the heist. Receiving a boost in the right direction from a mysterious benefactor named Yost, Walker heads first to L.A. to track down his double-crossing ex-wife, Lynne. 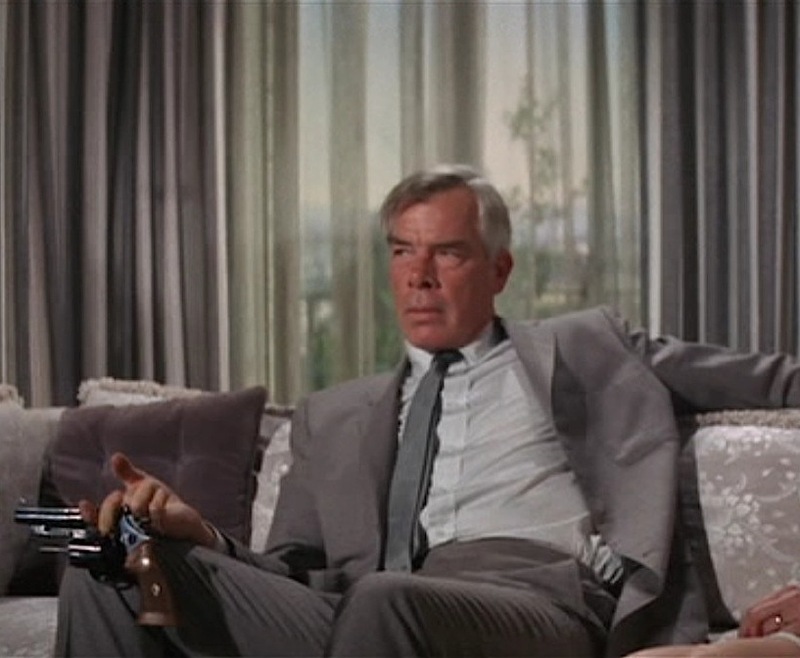 Walker is considerably well-tailored for a man on the run, wearing at least three different suits and two sharp sport coats during the duration of Point Blank. After his recovery, Walker sets off on his mission. He’s all business, and he shows it by dressing in gray – the traditional color of the American businessman. His suit is far from traditional, however, with its military-like cut and details like the symmetrical chest and hip pockets that evoke the 4-pocket front of the classic U.S. Army dress tunic. The suit, constructed of light gray semi-solid flannel, has a single-breasted jacket that fits comfortably on Marvin’s athletic 6’2″ frame. It has notch lapels that roll easily down to the second button of the 3-button front. The two cuff buttons are light gray plastic to match those on the front of the jacket. The most distinctive aspect of the jacket are the two patch pockets on each side of the chest; typical suit coats have only one breast pocket – on the left and usually welted. It also has flapped straight hip pockets and a short single rear vent. Walker – at leisure and in action. The structure of the jacket perfectly flatters Walker for whatever situation he finds himself in. When he wants to look formidable, he stands with the button fastened and elicits a military-esque image. When he is tired and relaxed, he unbuttons the jacket and leans back against Lynne’s couch, looking more casual than sloppy and still every bit as fashionable. His trousers have a clean, minimalist look with a fitted, low rise waistband devoid of belt loops and fastened by an extended square tab with a hook closure in the front. The side pockets are situated along each seam and the rear pockets are jetted with no visible buttons. They are flat front with plain-hemmed bottoms with no cuffs, buttons, flaps, or folds breaking the trouser line. Although Walker doesn’t do his trousers any favors by sleeping in them. Walker’s shoes, a pair of brown cordovan leather derby shoes with longwing broguing and medallion-brogued toecaps, are briefly seen as he kicks his way into Lynne’s apartment. We get a better look at these shoes two suits later when Walker is conning his way into mob boss Carter’s office… but I’ll cover that suit later. Lynne’s rough day is just beginning. Walker wears a pair of regular black socks. Since his trousers are gray and shoes are brown, I would have worn a pair of gray socks instead, but I wasn’t the film’s costumer (in fact, Margo Weintz was uncredited for her work on Point Blank so it would make sense if you didn’t know who the costumer was). This isn’t necessarily an error as it’s just the man’s choice, but there is a slight technical error with the film when we hear his shoes clicking around as he walks around Lynne’s hard tile floor… in only his socks. Walker finds himself in an unenviable position. Interestingly, he wears a pair of gray socks the next day… but with a blue mohair suit. When we first see Walker on the ferry from Alcatraz, he wears a light gray shirt and slim black tie (as seen in some of the above screenshots). By the time he reaches L.A., Walker has changed into a pale blue cotton poplin shirt with a spread collar, front placket, rear darts, and squared 1-button cuffs. This may not be the most comfortable resting position, but it sure as hell beats the floor of a cell at Alcatraz. He also wears a different slim necktie, this time in slate blue silk. Like any good houseguest, Walker puts down his .44 Magnum after he’s finished using it. As one would expect, Walker is a man of few accessories. He removes his only piece of jewelry – his plain gold wedding band – to place it on Lynne’s hand after (SPOILER ALERT!) her overdose. The sequence continues to show his toughness, as he manages to elicit a full, teary confession from Lynne without saying a word… or even looking at her. Walker’s “sword of revenge” throughout Point Blank is a Smith & Wesson Model 29, the classic .44 Magnum revolver that would go on to cinematic infamy as Dirty Harry’s “most powerful handgun in the world”. Unfortunately for Smith & Wesson, the film didn’t have quite the booming effect on sales that Dirty Harry would, and the firearms manufacturer was forced to suffer through four more years of the average Joe not caring about its most powerful production revolver. Walker and his gun show Lynne who’s boss. With a muzzle flash like that, I’d probably assume the gun had a kick to it, too. As I have yet to read Westlake’s source novel The Hunter, can anyone tell me who has read it what firearm(s) Parker uses in the book? Just curious! What do you say, gang? .357 or .44? Check out the movie. I have a feeling I should read The Hunter as well. Been looking forward to this one for a long time! Thanks. Good to know you are covering more suits from this film. My favourite part of the movie has to be Walker walking down the airport walkway with the “clack-clack-clack-clack” sound juxtaposed over subsequent non-walking scenes. How’s your head, by the way? That’s an N-frame S&W. Not even a close call. And as tough as Lee Marvin most certainly was, the claim that he felt “no recoil at all” from a live 4″ .44 magnum made me laugh loud enough for my secretary three rooms away to ask what was funny. I always thought N-frame too, but there are a few K-sayers out there. Based on the bore, it looks like a .44 as well rather than the .357 Model 27/28. I’m an admin at IMFDB, and there’s always plenty of debate – this movie and Payback both have plenty of .44 vs. .357 discussions. I tend to stick to my guns (pun intended) and support that both Walker and Porter use the .44. I know I would if I was as pissed off as Walker. I love the thought of a guy like Lee Marvin popping off rounds from a S&W .44 Magnum like it’s a .22 target pistol, but I agree that it’s unlikely. I’d love to find the original source; the story is probably just an apocryphal one that grew with Point Blank‘s cult following. In the book Parker (not sure why he became Porter in the films) doesn’t have a gun of his own for most of it. He follows the same path as in “Payback” – steals a wallet, pawns some goods, and suits himself up, but doesn’t purchase a gun from anyone. He kills most people with his bare hands and people are terrified of his hands – like he says to one guy “I’d touch you once – and that’d be that”. And later on, he does.